To tell the entire story to police and school officials with such clarity as to impress everyone. And all you have to do is enroll and share your child with us for a few years? Well you don’t have to worry about enrolling because you are already members of that program, but you do have to see it through, to black belt and beyond. This kind of personal development does not happen in just a few months. Our approach in the LEADERSHIP PROGRAM is to make these skills habitual. You need consistent, regular exposure to the life skills. And you also need to practice them regularly in a structured, supervised environment. With this approach, you will be able to use them under pressure–as you will see in this story. And won’t it be great when you experience similar results with your child? Eleven-year-old Laura has been a member of Babin’s ATA Martial Arts for four years. She earned her 2nd degree black belt on September 11, 2012 and has been a member of our LEADERSHIP PROGRAM for three years. Her journey to 2nd degree has not been easy. There have been disappointment and struggles. But Laura’s enthusiasm and her parents’ consistent support have produced some amazing results. Recently, while walking home from school, a boy about her age ran up to her and said, “I’m gonna kill you, m______ f______!” He then ran off. Laura rushed home and immediately reported the incident to her parents, Susan and Russell. Strangely enough, the bully appeared again the next day in a similar spot. However, Susan had prepared Laura who recorded the whole exchange on her iPHONE. With this evidence, Susan and Laura spoke to her teacher who called in the Mesa Police Department’s “school officer.” The police called in the alleged bully and his mom and had a detailed conference. The police even read him his Miranda rights! The following is the note we received from Susan, Laura’s Mom. Her own words describe it all the best, especially her comments about the LEADERSHIP PROGRAM. 1. The Mesa PD officer was very, very impressed with Laura’s poise. She sat up straight, looked him right in the eye, and spoke confidently. I’ve always taught my kids respect but Laura had always been my shy one. The confidence that TKD has given her shows. 2. The officer was also very impressed with her handshake. Clearly the practice done in leadership has paid off. She took his hand, looked him in the eye, gave a firm shake and introduced herself. He was quite taken aback that this little slip of a girl gave such a confident handshake and told me as much. Once Laura went back to class the officer told me that he made a comment to both the kid and his mother, his words were “Well whoever this kid is picking on this girl, they’ve clearly picked on the WRONG kid”. Keep up the good work there. 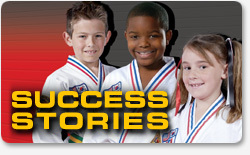 As a parent you may not see overnight or instant results when you first put your child in TKD, but I can tell you, over time, it shows how much it builds confidence and respect. Thank you!